HYPERTRACK software. The DSP-10’s inherent noise filtering algorithms allow it to work reliably in any electrical situation. 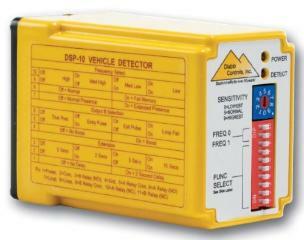 With its compact size, front panel switch features, and built-in flexibility the DSP-10 is the most “user friendly” detector on the market today. power failure. In this mode, continuity will occur between connector pins 5 and 10 whenever a vehicle is detected. connector pins 5 and 6 whenever a vehicle is detected. rarely moved from NORMAL. However, the DSP-10 has ten sensitivity settings varying from LOW (level 0) to HIGH (level 9). secure," it is the only parking detector you will ever need. The DSP-10 is available in 3 models. Loop Size - Works on any in-ground inductive loop from 20 to 1000 uH. Power Brownout Call Memory – Power interruptions of short duration are ignored. If power fails for approximately three seconds or less the DSP-10 “remembers” a vehicle. into the proper voltage and it works. Compact Size - Industry standard 11 pin connector in a small plastic case. Frequency – Automatically tunes within one of four operating ranges. Output A - Main detection output. Can be modified by delay and extension. Factory set to be fail safe. Fail mode operation is easily changeable by internal jumpers.